U.S. brokerages reported strong sales in June for the second month in a row and second-quarter sales totaled 10,340 boats, 2 percent above the same period in 2012. According to YachtWorld member brokerages reporting in Soldboats.com, their proprietary database, the increase brought the total through June to 16,245, 1 percent below the 2012 total of 16,334, but well above the five-year average of 15,073. June sales totaled 3,558, a gain of 3 percent from the same month a year earlier, and values rose 55 percent, from $311.8 million to $481.9 million. Aggregate prices paid in the second quarter reinforced a 2013 trend of rising values. Sales that totaled $1.19 billion represented an increase of 24 percent from the same quarter in 2012. For the year through June, values totaled $2.13 billion, a 21 percent climb from $1.76 billion a year earlier. Sales of 103 yachts over 80 feet, which averaged more than $7 million, contributed to the substantial overall dollar gains through June. Aggregrate prices in this size range were $399 million higher, with buyers paying more than double the $338 million that was paid for 99 boats by the middle of the year in 2012. Average prices also improved in the high-volume part of the market under 45 feet, which gained more than 3 percent in the first half of the year. In that size range 14,959 boats were sold for $901 million, up from $872 million in 2012. The soft part of the market in the first half of 2013 was between 46 and 79 feet. Sales improved in the second quarter from the first quarter for boats 46 to 55 feet and were up 5 percent in June, bringing total sales to a mid-year level similar to that of 2012. The total price paid remained slightly lower, down 1 percent on $228 million in sales. Sales in the 56- to 79-foot range improved significantly in the second quarter after a very slow first quarter, but were still down 11 percent for the year, at 369 boats. Compared with 2012, the total price paid was lower by 17 percent on $263 million in sales. This month, we took a closer look at sales in the Mid-Atlantic region — Georgia to Delaware — and found that through June, sales looked similar to overall U.S. sales. 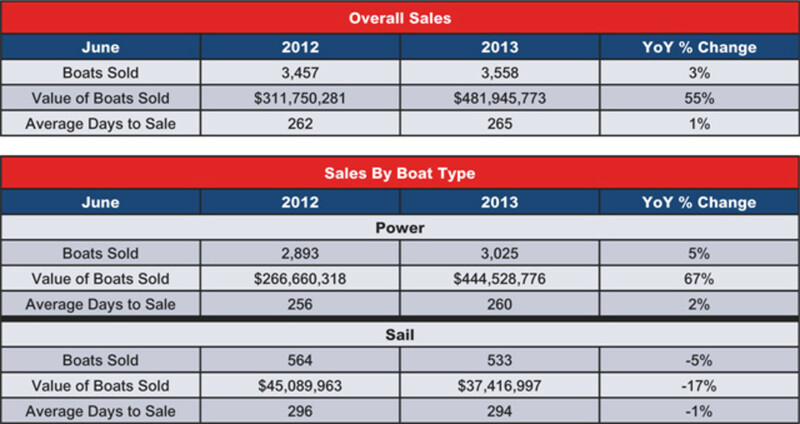 In 2013, Mid-Atlantic sales were 2,550 boats, 1 percent below 2012 figures. However, brokers selling sailboats have done slightly better than their counterparts in other regions, registering a 2 percent increase in sales, with 424 boats sold. Sailboat prices improved 3 percent on $34 million in total sales. Powerboat sales were lower by 2 percent, with 2,126 boats sold, but the aggregate price paid increased 1 percent, to $137 million.